Is branch coverage the same as decision coverage? I'm learning software testing right now, and I found that there are a lot of coverage criterias out there. And something just confused me. But other tutors all says branch coverage is decision coverage. So can anyone give me a clear answer about this? thanks a lot. Not exactly. As ISTQB Foundation book gives, branch coverage is closely related to decision coverage and at 100% coverage they give exactly the same results. Decision coverage measures the coverage of conditional branches; branch coverage measures the coverage of both conditional and unconditional branches. 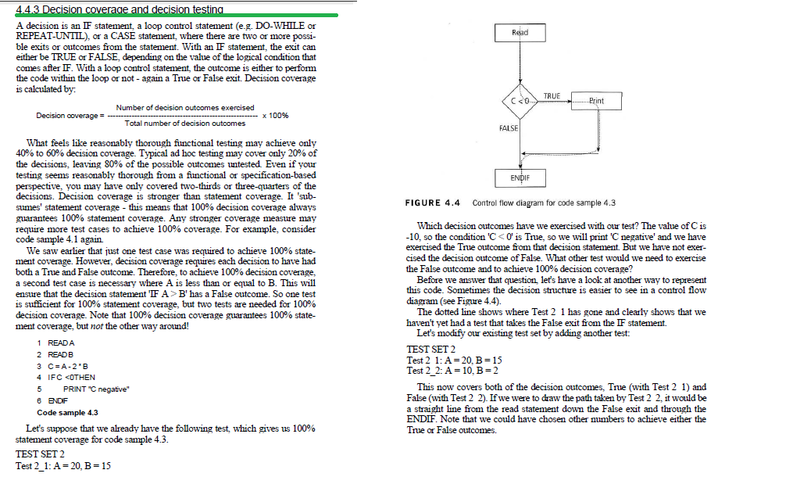 The Syllabus uses decision coverage, as it is the source of the branches. Some coverage measurement tools may talk about branch coverage when they actually mean decision coverage. (c) ISTQB foundation book. Not the answer you're looking for? Browse other questions tagged unit-testing testing code-coverage or ask your own question. What is a reasonable code coverage % for unit tests (and why)? What is code coverage and how do YOU measure it? What can I use for good quality code coverage for C#/.NET? How can I get 100% test coverage in a Perl module that uses DBI? What is the rationale behind the choice of specific kinds of coverage criterias when looking at an algorithm? How to measure code coverage in Golang? Branch Coverage and Assert Coverage? Difference between dd-path testing and basis path testing?